Another CSGO map but this one is very accurate and has additional features. You will be surprised, here even the distance between the main parts of the map is almost the same as in the original. In addition to the usual arena for combat, there is a store where you can buy weapons (so far only awp). Unfortunately here there is no money and an accumulation system, but perhaps something like this will be added later. You will appear at the point where you want to select the team. Call your friends as much as possible, but preferably not more than 9, otherwise the game will turn into a real war. 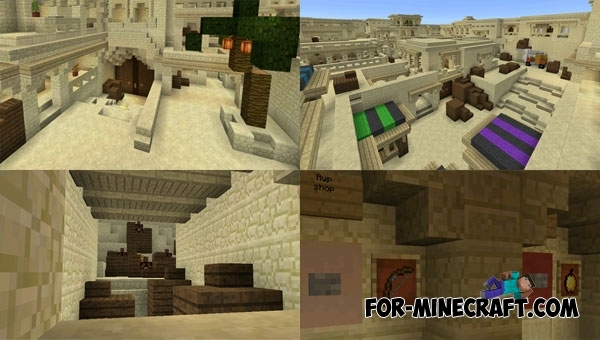 In addition to a single mode, this map is excellent for multiplayer and PvP servers. If you have a MCPE server, try to move the map to your server. To better immerse yourself in the atmosphere of the game, install the CS: GO Texture Pack which adds some weapons. During the game it is forbidden to break blocks or use cheats. The team that kills all the players of the opposing team wins. The number of rounds must be set by the administrator or the judge.